quad_09, a photo by ninettacaruso on Flickr. Just to let you know, my official English level as a foreign speaker is B1- INTERMEDIATE (European Council Level). That means - and it is - that I simply can't "understand a wide range of demanding, longer texts, and recognise implicit meaning". But I try. I do my best effort because I love communicate with all of you and I thank you very very much for your patience in reading me. That motif is the 9th square, rather "they are" the nineth evolving pattern, with a lot of INTERMEDIATE attempts between. The last in the left bottom is the last, I'm happy with that, it has a good edge connection with the previous motif. Techniques: split ring to climb from first to second round. It is 3 rounds, worked with 2 shuttles, both filled with Perfect Quilter threads sent by Fox, I don't know which color number they are, This thread is very similar to DMC #80, but it's softer. Giusto così per parlare, il mio livello di inglese viene classificato intermedio, B1 (European Council Level). Questo per dire che non riesco a capire testi lunghi e complicati e a cogliere eventuali battute o allusioni. Ma ci provo. Faccio del mio meglio perché adoro comunicare con tutti voi e vi ringrazio tantissimo per la pazienza che mettete nel leggermi. Questa piastrella è la nona, o meglio, "tutti questi" sono la nona piastrella, con diversi tentativi intermedi. L'ultima in basso a sinistra è quella che mi piace di più, si attacca bene alla precedente. Tecniche: ho solo usato l'anello spezzato per passare da un giro all'altro senza tagliare i fili. 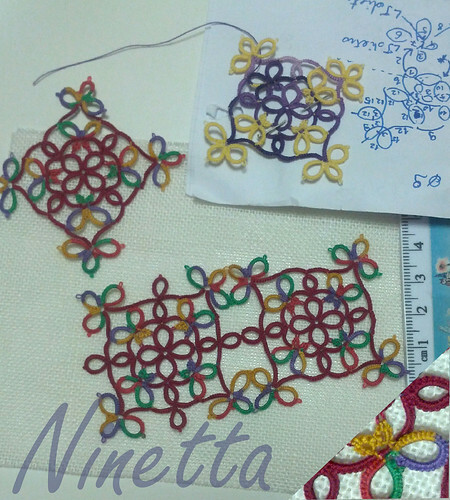 Ho usato due navette riempite col filo Perfect Quilter spedito da Fox, somiglia molto al DMC #80 ma risulta più morbido. Your English seems pretty clear to me! Lovely motif, and I like the bright colours. Very pretty - as usual! Beautiful Ninetta! Your English is very good :-) I missed you at the class Monday!